In 1796 Paris the toy maker Philip Le Marchard (Bruce Ramsay) is hired to construct an elaborate puzzle box of gold and wood. In 1996 New York his descendant John Merchant, haunted by mysterious dreams, has designed an entire skyscraper based on the puzzle box’s design. In 2127, the scientist Dr Paul Merchant works against the clock to enact a trap more than 300 years in the making. The Cenobites are coming. Hellraiser: Bloodline, the fourth in the series and the last to receive a proper theatrical release, is an interesting film to review. It is, in effect two different films. There is the film you can see: 82 minutes long, disjointed, confusing, and credited pseudonymously to Alan Smithee. There is also the visible potential of a second film: much longer, more complex and satisfying, strikingly original, and directed by noted make-up effects artist Kevin Yagher. Yagher’s intended film seems like it could have been something really special: an inter-generational saga of one family intertwined with the fortunes of Pinhead (Doug Bradley) and his fellow Cenobites. Shifted backwards from the contemporary setting of the first three films, the baroque style of the characters and the ‘Lament Configuration’ puzzle box fit in perfectly in a period setting. They fit so well, in fact, that an entire film set in late 18th century France would work brilliantly. Similarly, by shifting forwards into the future Bloodline pre-figures future science fiction horror blends including Event Horizon. It is the present-day section of the film that seems the weakest: either due to one too many trips to the well, or simply a lack of depth and characterisation. To be fair that lack of depth affects all three chapters of the film, and it seems caused by the studio-mandated edit that strips back everything that is not a scene of blood-soaked violence. Characters do not get properly introduced or developed, and while there is a story one can follow it feels arbitrary and under-developed. It was so harsh an edit that Kevin Yagher refused to put his name to it, and watching the final product it seems a wise choice on his part. The film seems not so much edited as butchered. Bruce Ramsay seems solid in his triple role of the three Merchants, although it is hard to tell for sure given how abruptly scenes begin and end. As the demon Angelique, Valentina Vargas feels a bit too ridiculous and camp. Doug Bradley is, of course, wonderful as Pinhead. By this stage he looks like he could perform the role in his sleep. The cadence of his speech is marvellous, and visually he has returned to the more effective make-up of Hellraiser and Hellbound. Production values vary from the inventive to the weak, suggesting a film that perhaps bit off a bit more than its budget could chew. This would not be a significant concern if the story was better, but it’s cut down to be incoherent and that simply brings any other shortcomings into sharp relief. 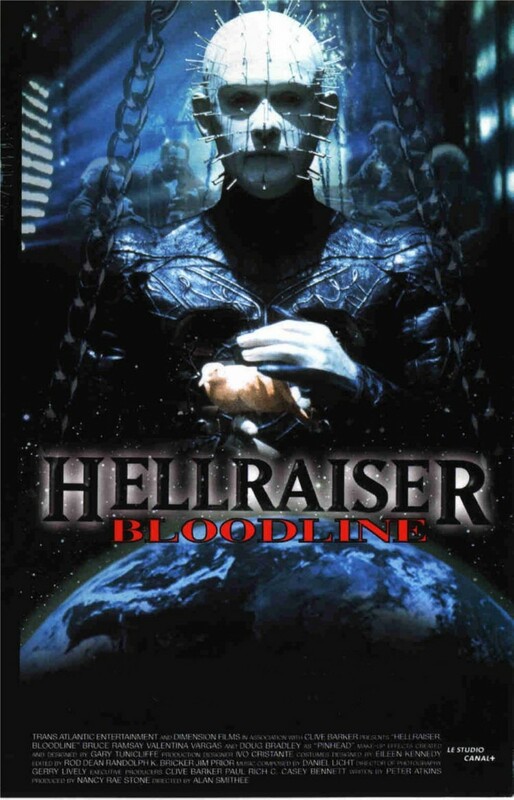 Hellraiser: Bloodline is a straight-up bad film, and it is a particularly frustrating kind of bad because you can see the potential sitting in clear view. Released in its originally intended form, it might not have been any kind of masterpiece – it’s impossible to tell any more – but certainly it had a lot of pretty great ideas.